Bill Spencer’s slept with his own daughter-in-law Steffy (Jacqueline MacInnes Wood) on The Bold and the Beautiful so he’s not exactly up for a Father of the Year award. Off-screen, however, it’s a very different story. 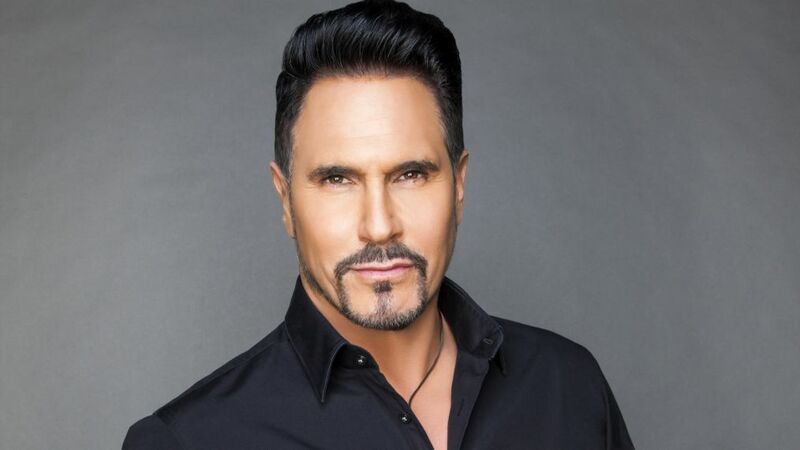 Just in time for Father’s Day, Don Diamont, who plays Bill, has released his autobiography. The page-turning tome details not only his life raising seven (!) sons — Lauren, Sasha, Alexander, Luca, Anton, Davis, and Drew — but also Diamont’s years in soaps on Days of Our Lives, The Young and the Restless, and B&B. He’s candid about romances with Gloria Loring (DAYS) and Eileen Davidson (Y&R), and why his wife Cindy Ambuehl (Seinfeld; B&B) is the love of his life. Read on to get the scoop from Diamont — and then read his book! Don Diamont: A couple of years. It’s a very personal book, which includes periods of difficult losses — my father, my brother, and my sister. Writing this book was the hardest thing I’ve ever done. Did you find as the writing process continued you ended up sharing more than you’d planned? Maybe. I didn’t go into it with a pre-conceived notion. I didn’t see it as the memoir it became. But so much of my life experience has informed my decisions, especially in my personal life with my kids. The latest addition is coming to us from overseas! Did you let the women in your life know that you’d be writing about them? I did in some cases. They were all wonderful about it. Even Eileen Davidson (Ashley, Y&R)? You write that she’s 'a bit aloof, with a biting sense of humor'! [Laughs] Well, that’s not the whole of who Eileen is and I don’t think that’s the [full] impression I gave of her. But, at the time we met, that’s who she was. Did you have a ghostwriter? Initially, yes. But when that first manuscript came in, I started to read it and thought, 'This is not my voice or my take on situations. This is not me. I decided I’m writing this book myself.' I absolutely had to have complete control over it. I couldn’t put something this personal out there without it having my voice. You lost both your dad and older brother, but became a parent to seven sons. Do you think there’s a grand scheme for your life? I was profoundly hurt and affected by my dad and brother being taken from me so soon. I didn’t see it coming. It was not how I envisioned life. I thought they’d be there to meet my wife, my children, and to share experiences. That was just gone almost in the blink of an eye. Those scars remain. I wanted children. I candidly write in the book that I wanted to have sons. I wanted back what was taken from me. I wanted to recreate that. I had the incredible blessing of [biological sons] Alexander and Luca [with my first wife, Rachel]. I have been rewarded many times over. After you and Rachel split, you still regarded her sons, Lauren and Sasha, as your own. Absolutely. Many people have made your observation. There was never, ever a moment where [anything else] was in my consciousness. It was crucial for me that these guys understand that I was leaving their mother but I wasn’t leaving them. I will always be there for them. I’m here and I’ll always be here. Actor Michael Mealor tells us about his character's calculating next move. Gloria, Eileen, and Cindy have all been in the public eye, but did you talk to Rachel how she’d be portrayed in the book, which is, at times, negative? Has there been any response from her? [Laughs] Not yet. It wasn’t without any consideration, but the story is not tellable otherwise. Have your sons responded to the book? They are actually reading it now. I had books delivered to the house and they’re in the process of reading it. I would imagine your journey would be quite different without Cindy who, by all accounts, is this amazing, strong, loving wife and mother. You’re pretty much saying what’s all in the book. Cindy has a tremendous goodness — she has an open, warm, loving heart. There’s no ‘quit’ in her. She can take on any challenge. She is tenacious. She’s ‘Superwoman.’ Anyone who knows her knows that’s the truth. What do you want the readers to walk away with from reading your book? Many things. Overall, kids have to be your priority when you’re a parent. Be accountable. If I ever left town to go do a movie, I’d realize it’s more important to be there for my kids. There’s no greater reward. What do you hope your sons learn from you sharing your story? An understanding of me, who I am, and why I made the decisions I made. I’ll hear a parent talk about how they will give in all their time to their children. Sometimes, you hug them and kiss them and you express how proud you are of them. Others, you have to stick a foot up their [rear end]. They don’t always appreciate that, but it’s a must. There have to be boundaries and expectations of behavior. You’re doing your kids a disservice if you don’t do that. Saying ‘yes’ to everything is bad form. You write about how your father was both your best friend and your dad. Do you enjoy playing Bill more than you enjoyed playing Brad? Come on. What do you think? I enjoy playing Bill infinitely more. He’s a complex, rich, and emotionally challenged. He wrestles to do the right thing. I have the freedom to inject my own sarcasm into him. The collaborative nature I share with Brad [Bell, B&B’s executive producer/head writer] is an incredible blessing. Not every show runner is willing to listen. I’m grateful. The only thing better than playing Bill Spencer would be playing him on cable. Bill’s a combination of Axe from Billions and Ray from Ray Donovan.